At the International Joint Conference on Neural Networks held this week in Dallas, researchers from IBM have taken the wraps off a new software front-end for its neuromorphic processor chips. The ultimate goal of these most recent efforts is to recast Watson-style cognitive computing, and its recent successes, into a decidedly more efficient architecture inspired by the brain. As we shall see, the researchers have their work cut out for them — building something that on the surface looks like the brain is a lot different from building something that acts like the brain. 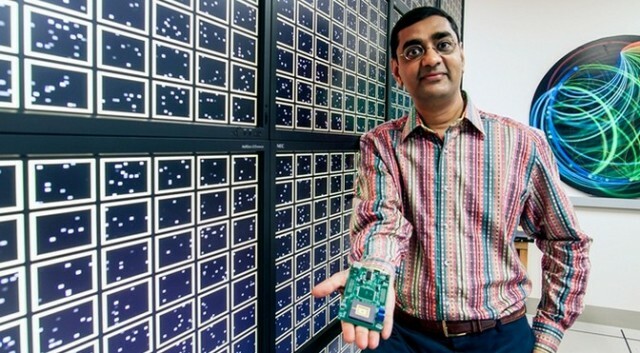 Head researcher of IBM’s Cognitive Computing group, Dharmendra Modha, announced last November that his group had simulated over 500 billion neurons using the Blue Gene/Sequoia supercomputer at the Lawrence Livermore National Laboratory (LLNL). His claims, however, continue to draw criticism from others who say that the representation of these neurons is too simplistic. In other words, the model neurons generate spikes like real neurons, but the underlying activity that creates those spikes is not modeled in sufficient detail, nor are the details of connections between them. To interact with IBM’s “True North” neural architectural simulator, the researchers have developed an object-oriented language they call Corelet. Building blocks, or corelets, can be built using 256-neuron neuromorphic CPUs designed to do specific tasks. The “True North” library already has some 150 pre-designed corelets to do things like detect motion or image features, or even learn to play games. To play pong, for example, a layer of input neurons would be given information about the “ball” and “paddle” motions, an output layer would send paddle motion updates, and intermediate layers would perform some indeterminate processing. Like a pong controller, a simple network such as this would have inputs, outputs, and intermediate neurons, but unlike pong, the spiking capability and activity would bear traceable relevance to the task at hand. Systems of neurons built on top of a circuit, like a reflex arc, could be added later — but without the underlying relevance to the real world, not only are they meaningless, but impossible to comprehend. If, however, researchers insist on jumping right away to massive neuron count models, perhaps we might suggest a thought experiment to probe how arbitrary networks might be functionally organized. If an individual neuron is going to generate meaningful spikes, the consensus is that the neuron needs to have some minimum level of complexity. For the thought experiment then, let a neuron be represented by a whole person, and the spike of the neuron be the clap of the person. When assembled into a room, we know from general experience that a large group of clapping human neurons can quickly evolve synchronized clapping from initially random applause within a few seconds — no big deal. We might imagine the crowd clappers could also quickly provide an answer to the question 2+2, by similarly organizing beats of 4. The magic, and relevance, for designing network chips comes in when you begin to add the specializations of input and output. 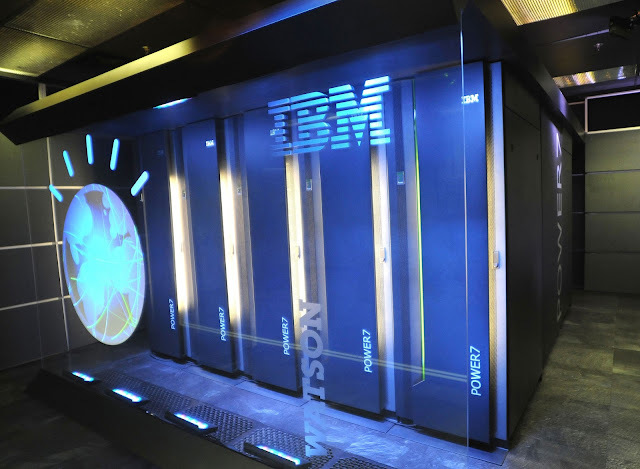 IBM Watson: Now IBM wants to produce a system that derives its intelligence from thinking, rather than merely searching through vast amounts of data. Instead of presenting the simple 2+2 query to the whole network, we can present it to just a few input units, who transmit the message in whatever way they see fit. Simultaneously, different queries can be presented to other input units. The output units then can be instructed to listen for messages and transmit outputs in the way that they see fit. The key addition we would require here is than the intermediate human units can move about some limited space to better hear activity of their particular choosing. Finally, we would need to add some driving energetic force to incentivize any behavior in the first place, and also limit the amount of claps or spikes they can produce. An example of this organizing incentivze might be jelly beans that are sprinkled onto the hungry crowd as it moves about. If the amount of clapping an individual can perform is then directly confined by the amount of jelly bean energy each unit can accrue, the energy-incentivation loop is closed and we have all the essentials for a neural computing system. If instead of trying to model extremely complex neurons in an attempt to capture and comprehend network behaviors, we simply create the real network just described and record its behavior for observation, I would offer that greater understanding into network dynamics relevant to real brains will have been gained, than any attempt using billions of simple processing elements. When we realize that each individual neuron, each cell, bears inside the full survival instinct and repertoire that enabled its amoeba-like forebear to thrive and reproduce on its own in a hostile world, we have some appreciation for the repurposed power possessed in each one. Ignoring the complexity of individual neurons beyond simple electrical behavior is folly if we desire to build computing systems with the power of the brain.